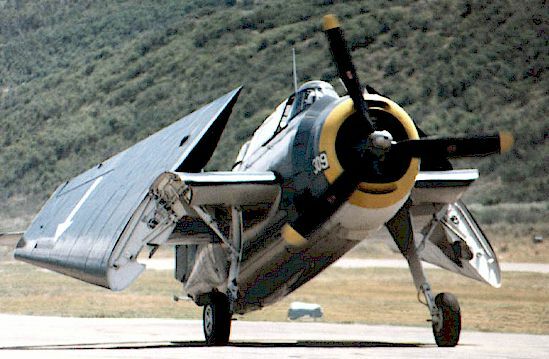 Cal's photographs cover the TBM-3E Avenger owned by the Confederate Air Force, Rocky Mountain Ghost Squadron, Grand Junction, Colorado Wing. All photos and captions Copyright © 1999 Cal Cochran. Photo 1: TBM-3E flyby, Aspen Air Show, July '90. Photo 2: TBM-3E from stbd, front qtr. Photo 7: TBM-3E taxiing, port profile, GJT, '91 air show. Photo 9: TBM-3E port profile, wings folded. Photo 10: TBM-3E from front, port quarter, during restoration - June '85. Photo 11 Pilot's cockpit, left sidewall, modernized. Photo 13: pilot's seat, from starboard. Photo 16: turret well (without turret) looking fwd, wide shot. Photo 17: Interior of aft fuselage, looking fwd, before installation of turret. Photo 20: turret interior details, gun "installed", from left. Photo 21: turret int. details, gun "installed, from right. Photo 22: turret int. details without gun, from left. Photo 24: Starboard exterior of installed & painted turret. Photo 26: port gear & well, after restoration. Photo 27: port main wheel, from inboard. Photo 29: torp bay during restoration. GJT, July '88. Photo 31: tailwheel, from stbd. Photo 33: Starboard, aft fuselage detail, during restoration, June '85. Photo 37: port engine detail, some cowling panels off, from slightly aft. Photo 39: starboard engine detail, some panels off of oil tank compartment, during restoration. Photo 40: stbd engine detail, cowling panels off around cylinder heads, during restoration. Again, with both of these, note original chromate colors and plumbing. Photo 41: engine w/o cowling, wingfold, starboard profile. Photo 44: engine & firewall from stbd front quarter. Photo 46: engine without cowling, from starboard. Photo 47: engine without cowling, from front.